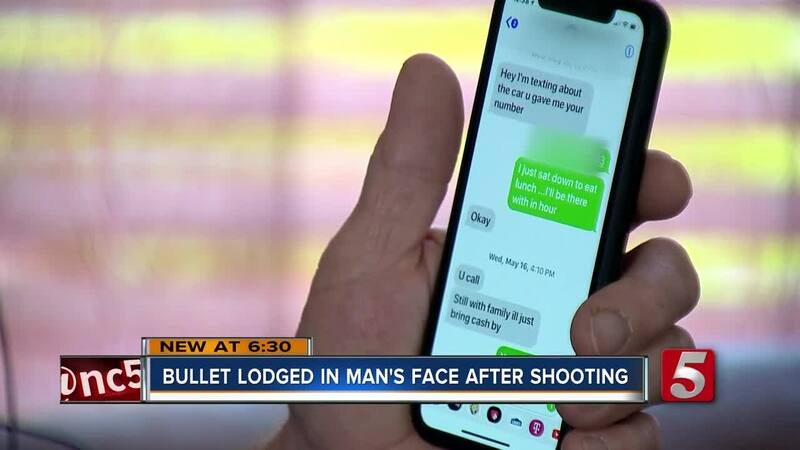 A Hopkinsville father is urging people to think cautiously when setting up to meet for an online sale after being shot in the face and nearly died. Barry Burchett, 58, had been in contact with a teenager who was allegedly representing his father to sell his car last week. Burchett said there was back and forth between the two and uncertainty at times, but admitted he really wanted to sell the vehicle. He agreed to meet the teenager at his house on North Vine Street last Thursday. Both struck up a light conversation, but it took a violent turn when Burchett looked down at his phone. "When my finger hit that screen, I heard what I can describe to you as the loudest boom I’ve ever heard in my life. I heard 'boooom' and that ain’t nothing," Burchett described. "But my head hurt so terribly bad. I felt the blood was coming out of my head like you turned the water faucet on." Burchett showed NewsChannel 5 where the bullet entered from the right side of his head down to the jaw. The bullet was still lodged next to his ear. He would have to wait two more weeks for doctors to determine if the bullet will be removed. "I feel like somebody hit me in the right side of my face with a baseball bat. It changes things to where small things don’t mean a difference no more," Burchett said. Burchett recalled pulling out his own pistol from his pocket once he realized he was shot. He said the gunman tried to wrestle it away but he managed to turn it on him. "I remember seeing the barrel of my gun right between my eyes. I didn’t turn that gun from me, God did," Burchett said. Hopkinsville police say Khalil Thacker, 18, threw the gun as he ran away and was eventually caught at a different home. He later confessed to the shooting. He was charged with Assault 1st Degree Assault and Tampering with Physical Evidence. Thacker is also accused of cutting his ankle monitor off. Jail documents showed he was just released from jail six days earlier for other felony charges. His family did not want to give a comment to NewsChannel 5. Burchett urged people to always meet in public areas and to always trust your gut. "Listen to yourself because your conscious will tell you a lot of times if something is wrong." Friends of Burchett have set up a GoFundMe to help with his medical expenses . Burchett is a truck driver and would likely not be able to go back to work in the near future.